Sigurður Flosason og Stefan Bauer kynntust í Kanada fyrir 15 árum síðan og fundu strax að þeir áttu margt sameiginlegt. Hugmyndir að frekari samvinnu kviknuðu strax en drógust á langinn af ýmsum utanaðkomandi ástæðum. Nú er þeir hinsvegar komnir á ról saman og héldu meðal annars ferna tónleika í Þýskalandi í desember sl og fengu frábæra dóma fyrir. Í þetta sinn er kvartettinn að hálfu íslenskur og að hálfu þýskur með Einar Scheving á trommur og André Nendza á kontrabassa. Þeir blanda saman eigin tónsmíðum og útsetningum þjóðlaga í leit sinni að enda veraldarinnar. Tónleikar þessa þýsk-íslensku hljómsveitar fara fram 13.ágúst kl 19:00 í Silfurbergi. 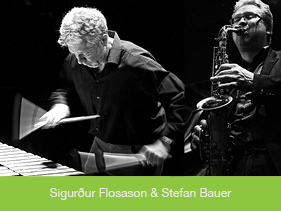 German vibraphonist Stefan Bauer and Icelandic saxophonist Sigurður Flosason met many years ago during a concert in Winnipeg/Canada (just south of Iceland’s expatriate community Gimli). As ensemble-oriented, composing musicians and players of great stylistic variety they immediately sensed they were pursuing common interests. Flosason is an emotional interpreter who in a contemporary manner blends tradition with a modern vocabulary. Bauer, who lives in NY, belongs internationally to the best vibraphonists. A key ingredient of their musical encounters is the acknowledgement of the power of folklore (imaginary or real) and using it as the basis for their improvisational explorations – folklore from the fundus and the experiences of two European world travellers. They team up with Icelandic drummer Einar Scheving and German bassist André Nendza. This concert takes place in Silfurberg/Harpa on August 13 at 19:00.